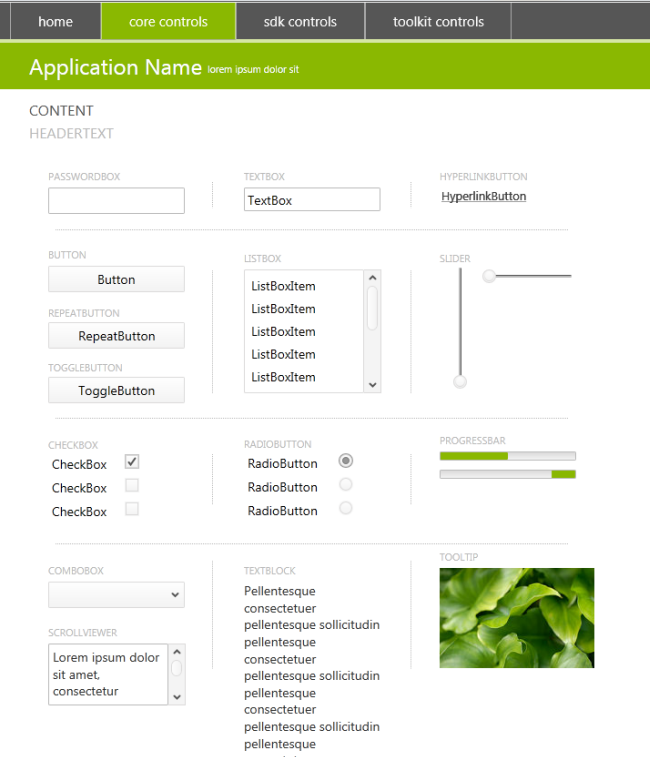 A while back I posted a sneak peek preview of 3 new themes that we were working on for Silverlight 4 applications. 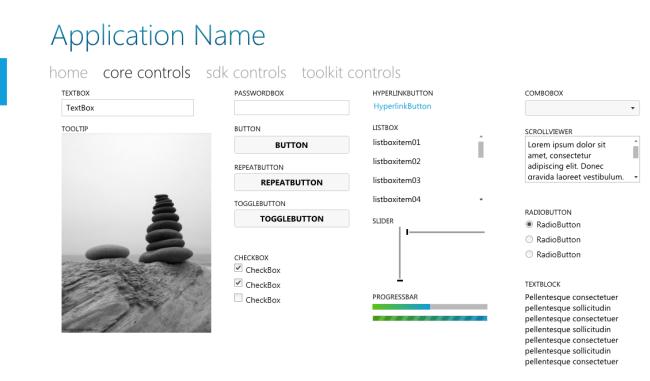 Our team wanted to do more than just the overall base theme and provide the themes for the core, SDK and some Silverlight Toolkit controls as well. In addition, there was a lot of internal chatter about how cool these new themes were and a lot of teams wanting to adopt them as default, including WCF RIA Services. This theme is a clean implementation that initially has a ‘greenscale’ approach to it, but modifying the brushes even slightly will give you some great color pallettes to work with. Honestly, initially this one didn’t pop for me as much, but the fit-n-finish added here is really making me like this structure. And the ability to change a single brush and have it replicate through other areas makes this clean template highly customizable. Want a theme for your application to look a bit more native? Here’s a starter place for you. And finally the most popular requested, we’re calling Cosmopolitan. This one has features that resemble the Zune and Windows Phone design language aspects of it in a modern, clean UI form. This theme also has a ToUpper and ToLower behavior files that you can apply to your XAML for text formatting. As you can see in here the files should be relatively self-explanatory. We tried to make it so that you can pick and choose what you’d like from them (as well as learn how to segment out these types of dictionary files). 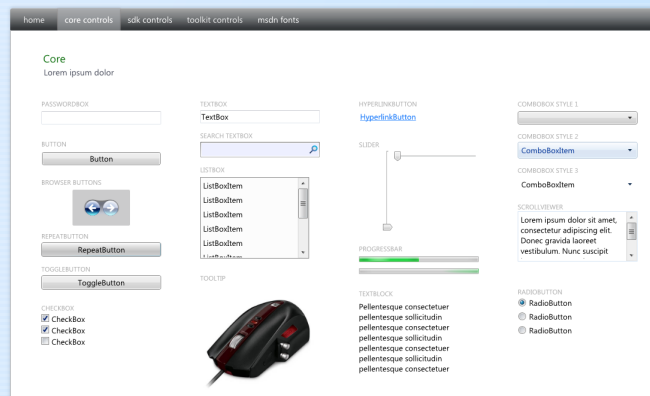 In each project you will also see the themes represented in showing: core controls, sdk controls and toolkit controls. Please make sure to appreciate all of them. I didn’t post screenshots of all here. The idea is that we’ll clean these up in a more distributable manner. 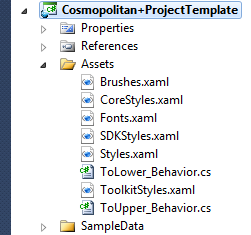 We’ll likely create VSIX files (Visual Studio extension installers) so that you could then say File…New Silverlight Cosmopolitan Application and have these already in there. This also allows us to put them in the Visual Studio Gallery where you can search/download directly to Visual Studio. We also will likely put the resources on the Expression Gallery for download. And as I mentioned before, it’s possible that future iterations of things like WCF RIA Services and such might use them as default. You tell me: what is the best distribution method? How would you expect to download/install/use these? I love these new themes. I think our design team did a great job here. Tsitsi and Corrina are awesome and put a lot of work into refining these. By the feedback that I’ve been getting in email and blog comments, these are exactly the type of things that you’ve been wanting. Mostly from developers I’m hearing the thank you for helping me since I have no design skills! This is great feedback that our team loves to hear. I hope you find these valuable. These raw project templates here are essentially the Silverlight Navigation Application template modified. We’ll have the biz app ones a while later, but these should get you started.